Did you ever wonder that maybe the earth is not solid, but hollow? This far-fetched idea was dreamed up by John Cleves Symmes in 1818, and believe it or not, many people thought that he might be onto something. Capt. John Cleves Symmes was a Philosopher, and the originator of Symmes Theory of Concentric Spheres and Polar voids; He contended that the Earth is a hollow place and habitable within. From the mathematical patterns he had studied of interlocking spheres he had observed in nature, he convinced himself that the world must be hollow, and proposed to the US Government an expedition to prove his theory. He claimed he would show entryways to the unexplored regions of the North and South Poles, and he lectured across the Midwest to generate interest in his well thought out theory. Maybe he was a good talker, or maybe the US population at the time really considered Symmes to be a mathematical genius. Whatever the case, he was able to convince the public to pressure congress into considering funding the polar expeditions to start in 1822 and 1823. He almost got the vote, but the Senate never approved the money. Another man who befriended Symmes, Jeremiah Reynolds, decided to help Symmes in his cause, and the two of them set a course for the east coast with a wooden model of the Hollow Earth, and packed lecture halls (at 50¢ a head) at every stop. The touring proved to be too much for Symmes, and he decided to retire to his Hamilton, Ohio home, leaving Reynolds to lead the cause of the Hollow Earth Theory. Symmes died in Hamilton in 1849. Reynolds again asked for help from the government, but his theory seemed to be going by the wayside with the new Jackson Administration. He eventually found a rich New York investor to pay for a ship, the SS Annawan, to explore Antartica to find the entryways to the world within. Alas, no portals were ever found. 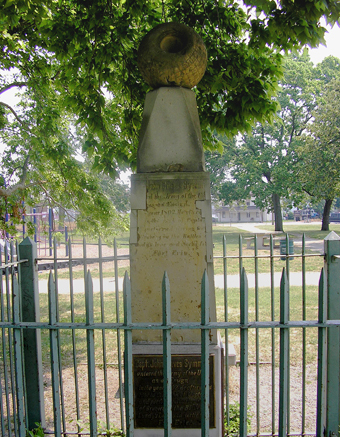 If you visit Ludlow Park in Hamilton, you can find a stone monument dedicated to Symmes by his son Americus Vespucci Symmes in the 1840s for all to wonder at (and about!). An inscription on the memorial reads: “Capt. 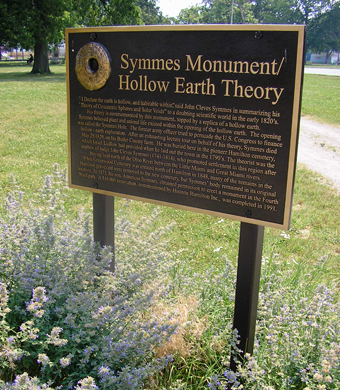 John Cleves Symmes, as a philosopher, and the originator of Symmes Theory of Concentric Spheres and Polar Voids; He contended that the Earth is hollow and habitable within.” Appropriately, a hollow earth made of granite beckons from atop the memorial. Contrary to popular belief, this monument is NOT a grave marker. It's just a monument. Symmes is buried, along with several of his family members, in Congress Green Cemetery, which is in North Bend, Ohio. 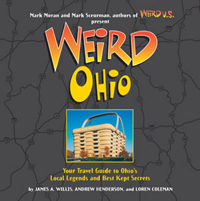 Since this is in fact a travel book of sorts, we feel that we should at least mention that the Symmes monument is located in a neighborhood that, well, let’s just say it’s not one of Ohio’s finest. When we last visited at 1 pm on a Sunday afternoon it was a real challenge getting a photo of the memorial without including one or more of the local homeless people who were laying all over the place. As for the surrounding houses, let's just say there were a lot of business transactions going on out front…at least in front of the ones that weren't boarded up and as hollow as the Earth itself.